Chelsea Codling spent the spring of 2016 in Graz, Austria, practicing her German and taking linguistic and cultural classes. When she returned, she knew she wanted to dive into researching the cultures of the world. “That experience helped me realize how important culture is in the context of archaeology and for discovering what life was like for people before us,” said Codling, who is a senior in the College of Letters, Arts and Social Sciences. Codling sought out Professor Mark Warner in the Department of Sociology and Anthropology to learn about potential research projects. The comparative bone lab is a collection of animal bones that can be used to identify bone samples found in excavations. For example, if Codling has determined that a bone was from a leg, she will compare that leg bone to leg bones from other animals in the comparative collection. She can use the comparison to determine what animal the leg bone came from. 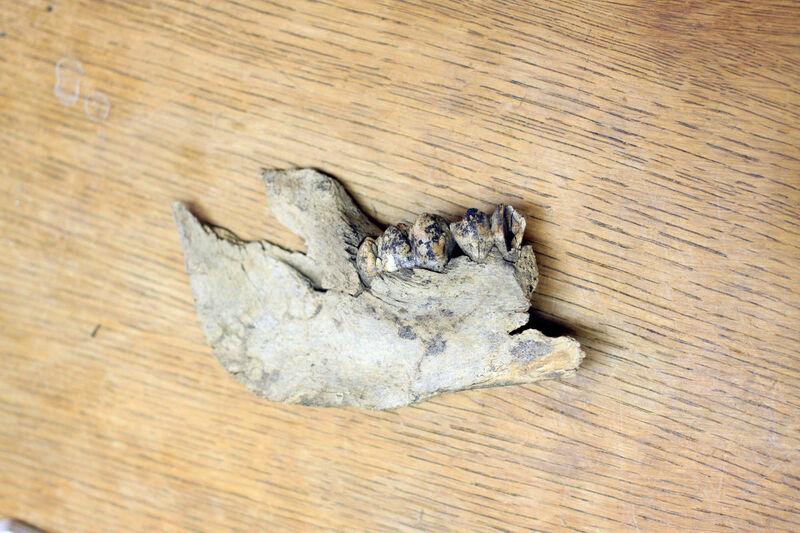 After completing an introductory project in spring 2017 with animal bones found at an excavation of Fort Boise, Codling jumped into cataloging animal bones found during an excavation of a Chinese mining camp in Idaho City, where gold was discovered in 1862. By 1870, the region’s population was nearly half Chinese. Generally, the Chinese miners worked on mines that had been previously claimed but abandoned. The bones tell Codling what kind of meat the miners ate. Using the comparative bone lab, Codling found pork to be the miners’ preference. This makes sense, she said, because pork is a traditional food in China. Codling also found bison bones in the samples collected from the excavation. Because bison has not been previously documented as a source of food in the mining camps, Codling said she has to find how that fits into the history of the mining camps. Once Codling identified all the bones, she examined scans of meat market ledgers, which are archived in Idaho City, to find the prices for pork and beef. 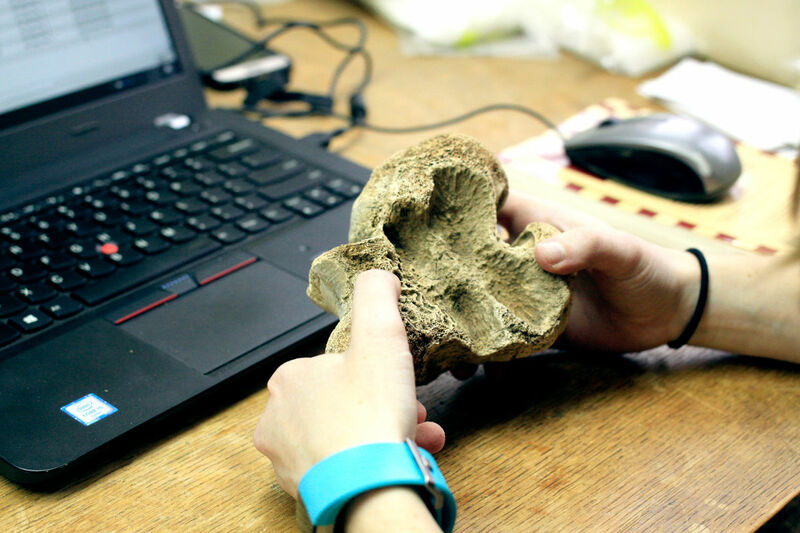 Chelsea Codling working to identify an animal bone. Codling said her initial lack of knowledge about the mining camp highlights the importance of the research into Chinese mining camps. Codling’s project is just one study stemming from the excavation. 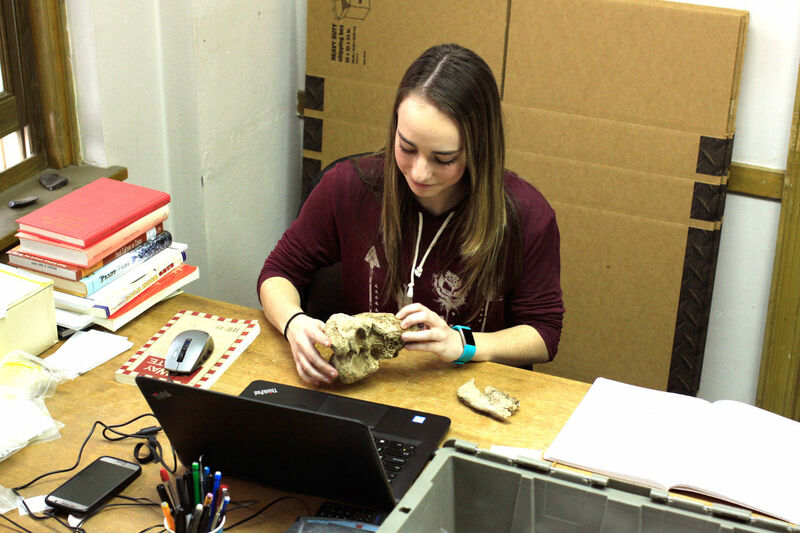 Renae Campbell, a doctoral student in the Department of History, is leading the sorting and analysis of items found in the excavation of the mining site. For her portion, Codling wrote an honors thesis and presented her research as a paper at a conference in March 2018. Warner said Codling has grown as a researcher throughout the project. The research project helped Codling solidify her career choice. After graduating in May 2018, Codling is going on an archaeological excavation in Nauvoo, Illinois, a small town in western Illinois on the Mississippi River. Part of a pig’s jaw bone. Article and photos by Tess Fox, a senior from East Wenatchee, Washington, majoring in journalism with minors in art and music. This project, “Cooperative Archaeological Activities”, was funded under USDA Forest Service grant No. 15-CS11040218-036. The total amount of federal funds for the project is $32,741.30, which amounts to 77% of the total cost of the project. The total amount of non-federal funds for the project is $9590, which amounts to 23% of the total cost of the project.